The programme is supported by funds from Misereor and CAFOD provides technical assistance. The programme is being implemented in the seventeen (17) parishes of the Diocese of Manzini. It targets both Catholics and non – Catholics. The methodology used is the Catholic Social Teaching which emphasises non-confrontational methods of solving conflicts. It promotes the spirit of social justice and focuses on the poor to try and sensitize them on their fundamental human rights. It is envisaged that when both men and women have the knowledge and skills they will be able to participate meaningfully is spaces that affect their lives. Community dialogues and campaigns are some of the strategies used to reach citizens. Social media, press statements are some mediums used to reach to the wider community. Process facilitation is used to engage the different sodalities and other structures in and outside the Church. 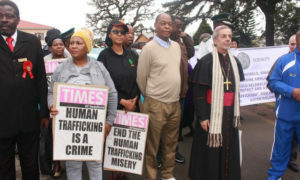 Recently the programme in partnership with the Government of the Kingdom of Swaziland have embarked on a nationwide campaigns to sensitive the public on issues pertaining to gender based violence and human trafficking. Caritas Management in collaboration with the Bishop’s office played a pivotal role in ensuring the success of these projects. Parishioners and church structures i.e. the Parish Pastoral Councils (PPCs) and sodalities e.g. St. Anne’s also contributed immensely to the success of the sensitization campaigns. The Bishop has been in the forefront of these activities.